Netflix are coming out with some incredibly good series at the moment – ‘Daredevil’, ‘Orange is the New Black’, and ‘Better Call Saul’ to name a few. ‘Narcos’ is another one that’s immediately risen to popularity, and it’s pretty easy to see why. Pablo Escobar, king pin of the Colombian Medellin cartel, is a fairly famous face – his actions lead to a devastating impact in Colombia. In season 1 of ‘Narcos’ we witness his rise to fame, as well as the destruction he causes along the way. Escobar (Wagner Moura) becomes involved in the cocaine industry during the late 1970s, expanding pretty quickly from small labs to much larger forest production. The DEA get involved (not knowing that he is connected at that time), and we see Steve Murphy (Boyd Holbrook) and his new partner, Javier Peña (Pedro Pascal) struggle to take down the industry while Escobar goes from strength to strength. He eventually decides to run for president but, after it all goes wrong, his political aspirations turn to revenge. Moura plays an excellent Escobar – one of the most immersive performances I’ve seen in awhile. He becomes the role immediately, with the distinct advantage of looking eerily like Pablo himself. Holbrook is also rather similar to the DEA Steve Murphy that he plays and, although ‘Narcos’ is about Escobar’s life, it’s just as much about Murphy and the new life both him and his wife have to take on. Murphy narrates a lot of the scenes within the series (echoing ‘Goodfellas’), which brings us a documentary-like account of the events alongside the visual portrayal – this, combined with actual footage littered throughout each episode, gives ‘Narcos’ that little bit extra. It’s also a stark reminder that these scenes of bloodshed and lack of remorse actually happened (mostly), which is all the more terrifying. The story is quite complex, seeming to be one that works better taken in slowly as opposed to watched all in one go. As the episodes go on it becomes all the more in-depth, yet also more addictive. There’s plenty of side-stories and cliffhangers to keep you entertained, as well as some excellent character development all-round. Some of the most interesting characters are the ones hidden in the sidelines, from Peña and Horacio Carrillo (Maurice Compte) who Murphy works alongside, to Escobar’s own mother (Paulina Garcia), who looks on with proud eyes as her son tucks packages of cocaine inside his jacket. I would have liked to see more development of Murphy as his character changes so much during the series, but I’m sure there’s plenty of room for that during season 2. 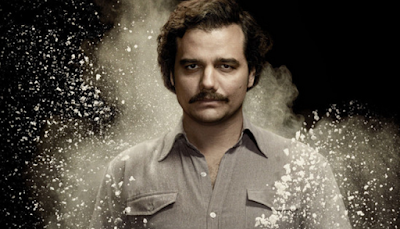 On the subject of characters, something I found particularly striking was how we were made to feel from start to finish – despite Escobar’s brutality and power-addiction, his strange charms and quirks still make us empathise with him somewhat. Some of my favourite characters actually weren’t nice guys at all, and I couldn’t understand the sadness I felt when they eventually got taken out. It’s very similar to how it’s done with ‘Breaking Bad’ – there’s a human portrayed behind each violent or untoward action, and a distinction between what’s nature, and what actually might be down to nurture. Subtle, but effective none the less.